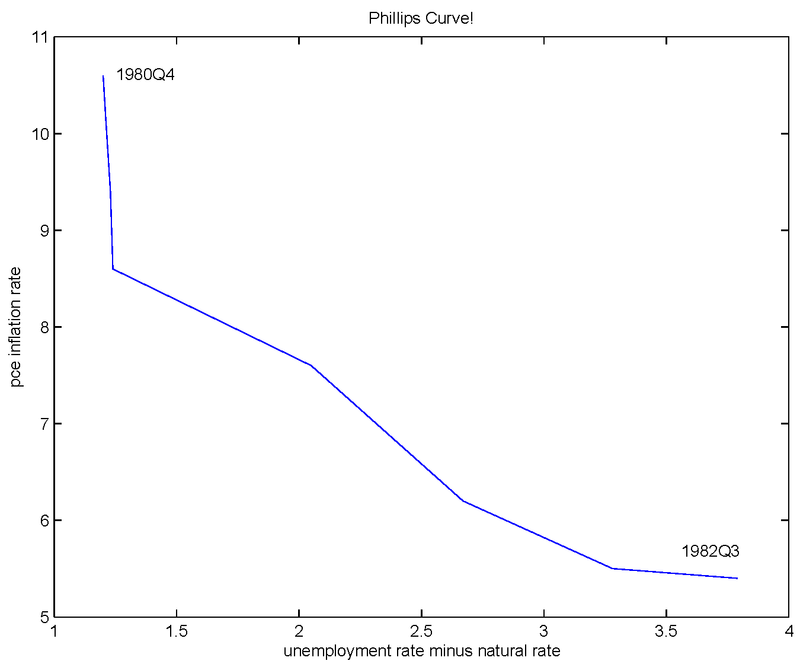 Typo: "So, in the next chart, the curve LRFR1 denotes the long-run Phillips relation, which is concave." Reading well so far, but I think I'm about to get to the bits I may disagree with! Any thoughts on Daly and Hobijn? They have some data on rigid wages e.g. figures 1 and 2. Sorry, I meant to post this under "Finger on the Pulse?" I had too many windows open. This is related to the NBER working paper someone else sighted. Not sure what to make of this. I want to understand what people think this has to do with recent history. 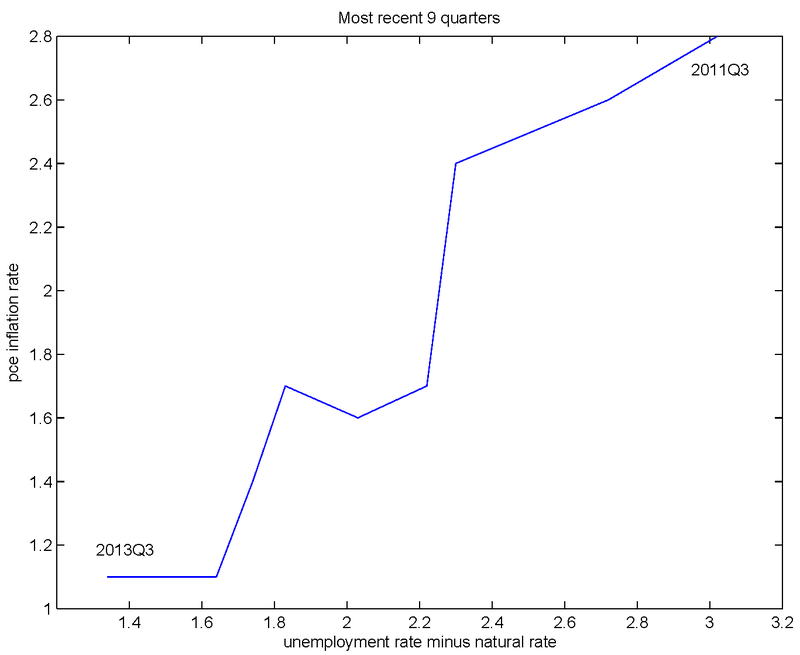 unemployment, which isn't too surprising. 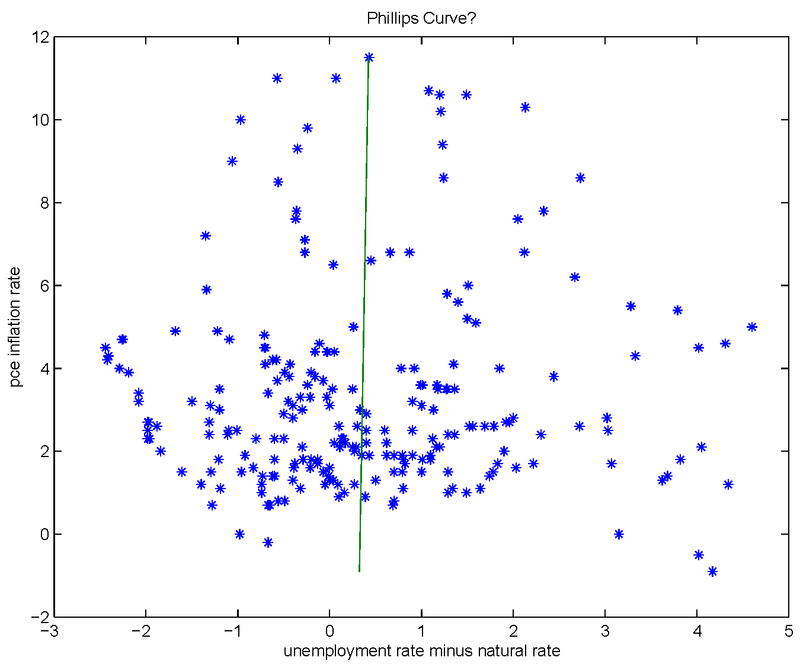 simultaneous deceleration of wage inflation and decline in the unemployment rate." Why that would be the case I would need to think about. 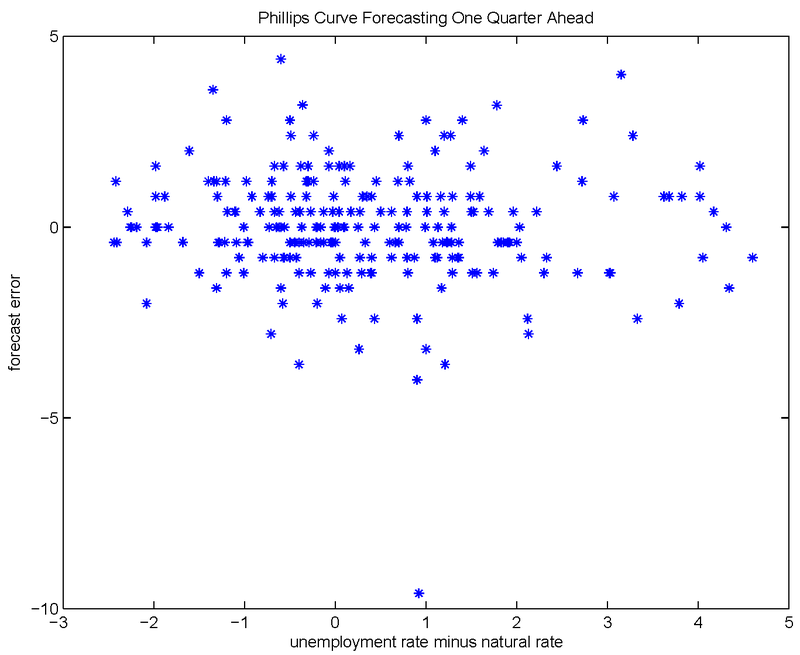 My intuition is that really low inflation decreases the speed real wages adjust, causing slower adjustments back to the long run Phillips Curve. The long run could be longer in coming. 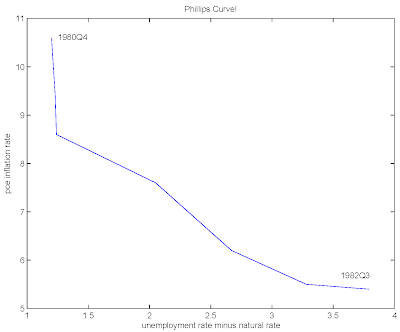 I don't understand quite yet the logic why the long run Philips curve would be non-vertical as one of their figures implies. 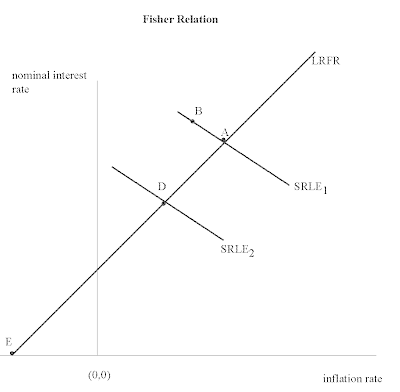 If you put a lower bound on nominal wage changes, then if you have a long period of low inflation and the constraint binds, the distortion will be cumulative, and over time you'll have a real wage that is way too high relative to what is efficient. But currently the rate of nominal wage increase is going up, and the inflation rate is going down. What do you make of that? That would be problematic, wouldn't it. But what measure of nominal wages do you have in mind? Daly and Hobijn use a composite index of 4 measures including BLS microdata. The only one on I could quickly find on FRED is the Employment Cost Index (linked below). I don't see acceleration of wage inflation in that index, but I am not an expert when it comes to wage data, so I am not going to argue it is the right one to look at. I was just looking at the series Krugman used in his blog post (see http://newmonetarism.blogspot.com/2013/12/grilled-cheese-sandwich.html). I had no good reason to think that was a good measure of the aggregate wage rate. In any case, I was thinking that we don't have to be looking at wages. 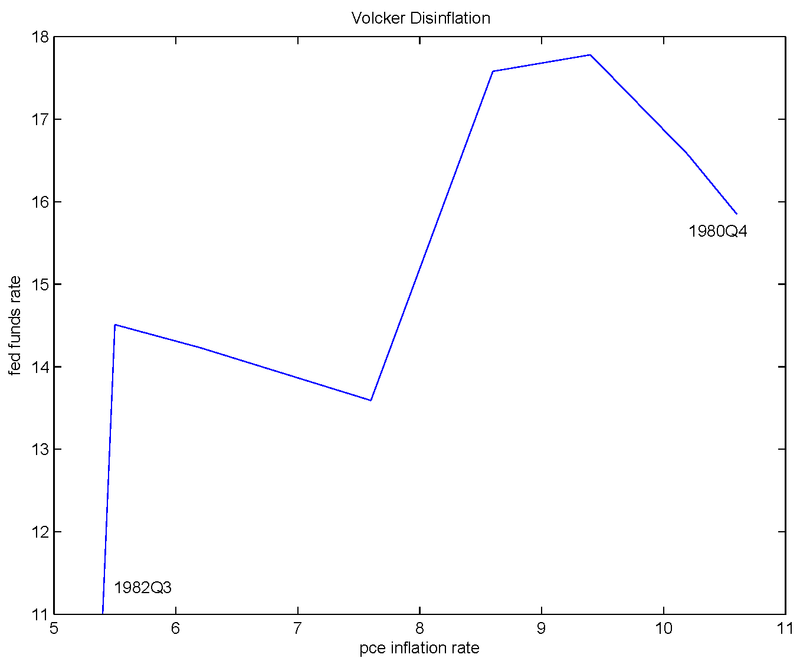 The theory says that when there is low price inflation we should observe high unemployment. I don't see that in the first chart above. Yep that is a bit interesting. 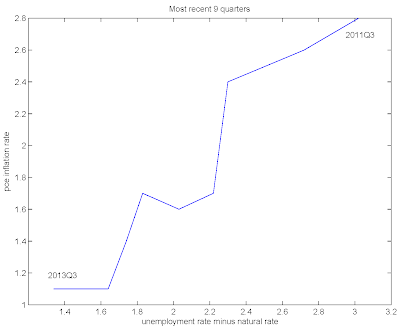 Krugman goes on to link to the Daly and Hobijn paper which theoretically implies something different than what the data now shows. 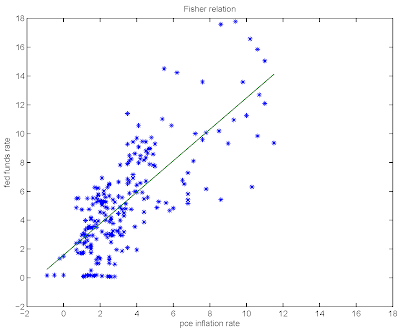 Earlier in recession the correlation works out (at least with regards to wages), but not anymore since about a year ago, though who knows what the Daly Hobijn index would show. If you meant the last year by "I want to understand what people think this has to do with recent history." that is a good point. 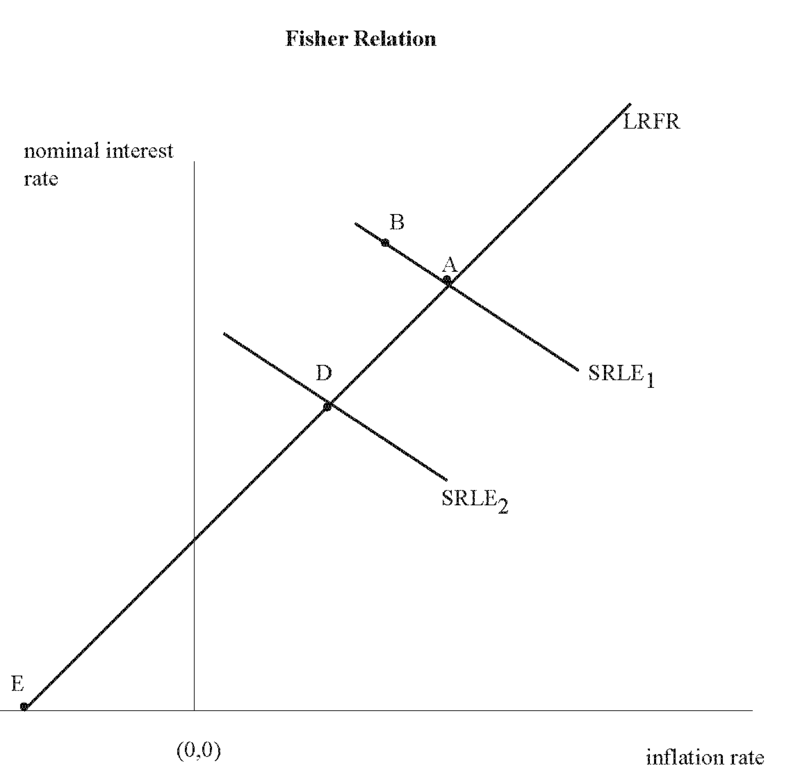 Another point with the Krugman graph, I don't know if the decreasing rate of wage inflation is all that different post 2001 recession and the last one. I would have expected a bigger difference based on the quote I posted a few comments above given the different magnitude of two recessions. 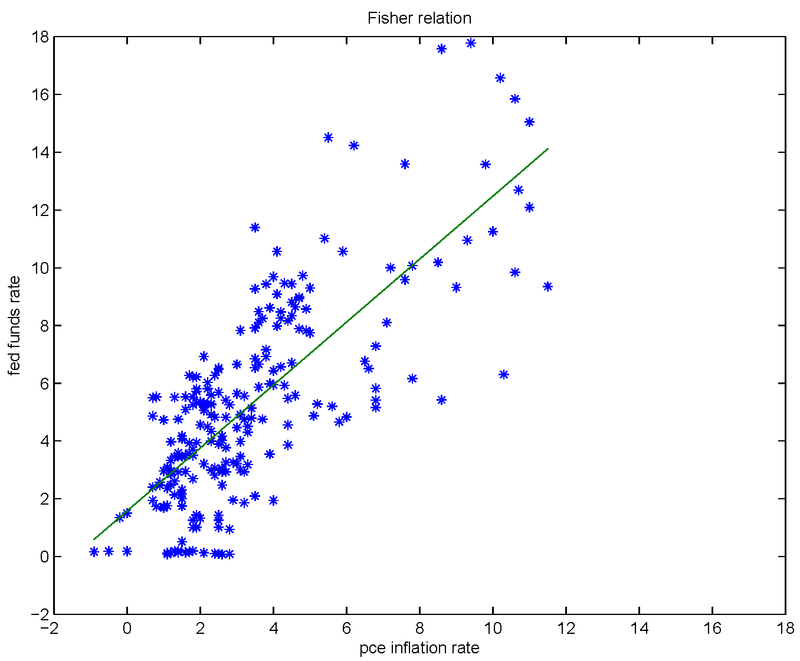 I think what everyone trips on is the idea that moving the FF rate up would actually increase inflation. 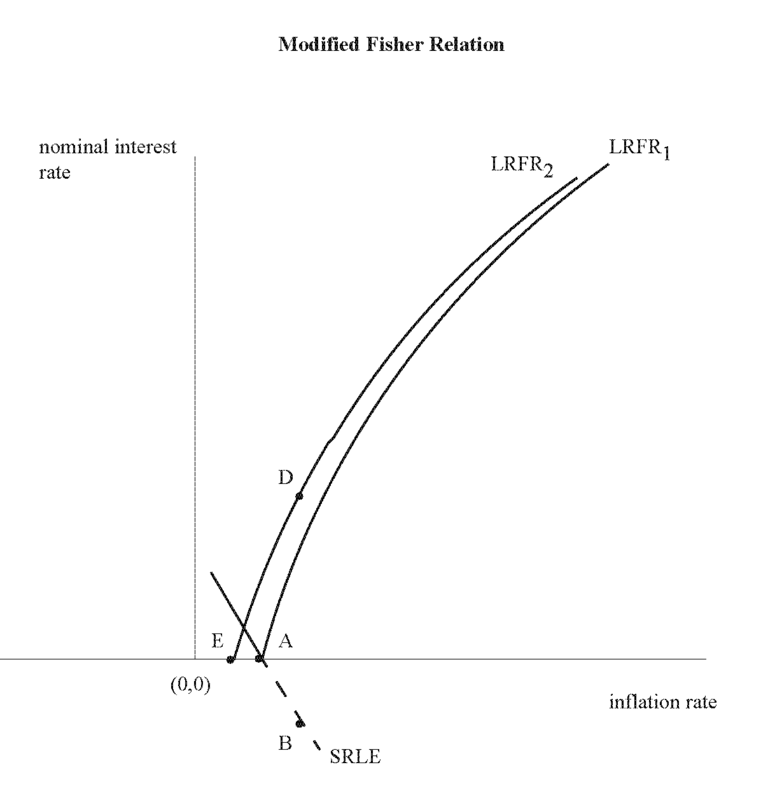 To be sure Market Monetarists like Sumner always quote Friedman as saying that low nominal interest rates are a sign of tight money but what they mean is that in the longer run nonminal rates will go up with higher inflation and more growth. You're heterodoxy from their standpoint is a kind of reverse causality. That it's' not that higher inflation will lead t higher nominal rates but that nominal rates will actually cause higher inflation. I give you credit at least for shaking things up-I tend to think they've gotten a little complacent anyway. Causality isn't really an important part of the story. I'm just talking about relationships that have to hold in equilibrium. But, I think it's clear that, if the central bank can control anything, it can control the nominal overnight interest rate. Thus, it's useful to think of policy in terms of the overnight interest rate as a policy instrument. In general we want to think about alternative policy rules - how the overnight rate should respond to various endogenous variables - when we evaluate policy. In this case, though, my starting point is a very simple question: What happens if the central bank pegs the nominal interest rate at zero for a long time? And the answer is: no one should be surprised if this produces low inflation. Mr. Williamson let me just be straightforward: are you suggesting that higher public debt by the U.S. government would now be stimulative? So is the best thing the U.S. Congress can do is pass the President's jobs bill? Those are two different questions.Yes, I think part of our problem is insufficient government debt. There of course many ways to get more government debt. You can have a temporary tax cut. That's straightforward. But I haven't studied the jobs bill, and have no idea what's in it. Then I have nothing bad to say about you. 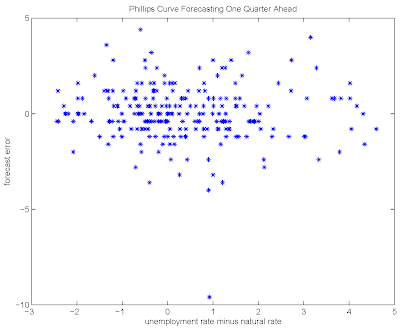 See you and Krugman don't agree on the Phillips Curve-what its shape is, whether it's useful or not. My feeling about it is-who cares? You both agree there's a liquidity trap-ok you seem to differ with him on why there's one-and you both agree that what we need right now is an increase in public debt-again for maybe very different reasons. I agree, As far as I'm concerned that's good enough for me. So I'm a Krugman fan and a Stephen Williamson fan. Its not that as a layperson I don't have respect for theoretical disputes-I'm aware they are often very important and fertile ground for furthering our economic knowledge-one of the most important things in the world for human society. Still I'm also a pragmatist. If we do fiscal stimulus for the right or wrong reason doesn't matter to me. 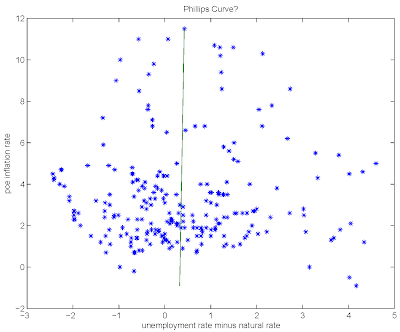 If policymakers do it with the wrong understanding of the phillips curve it will help just as much. "If we do fiscal stimulus for the right or wrong reason doesn't matter to me." I disagree. I think it should matter. Policymakers can be doing the right things for the wrong reasons. That might work for a while, but eventually they'll get into a situation where they do the wrong things for the wrong reasons. Where I part ways with Krugman is mainly in his lack of respect for the majority of people who are actively engaged in macroeconomic research, and for some of the people who made key contributions to the profession in the last 40 years. That lack of respect is both uninformed and unnecessary. Let me suggest that there can be wrong reasons to bash Krugman as well. Let's assume you're right in your criticism of him-the truth is I can admit I don't know. I don't hang in the circles you and he do so I don't know the peiople you believe he disrespects and so I can't have an informed opinion about it. What I do know is that most of the people who hate Krugman do so for the wrong reasons-they oppose increasing government debt by hook or by crook. I believe your a Canadian by birht? If so you may not have a sense of just how nasty politics is down here even if you now liver here-it depends how much you personally follow politics. "Steve, I claim that action would lower TIPS spreads. 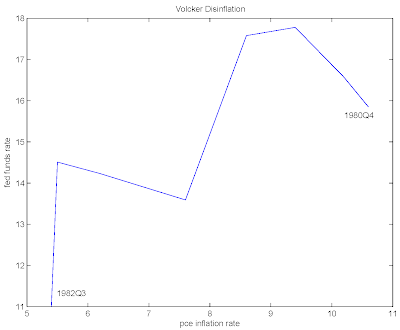 The best way to raise inflation rates is to raise the NGDP target path, and do level targeting. The expectations of faster NGDP growth (if sufficiently large) will tend to raise TIPS spreads and probably long term rates." Yep, the answer is-NGDP targeting preferably with a NGDP futures market sort of modeled on the TIPS market. How did I guess that would be his answer? Nick I don't think I have any trouble guessing where SW lost you.